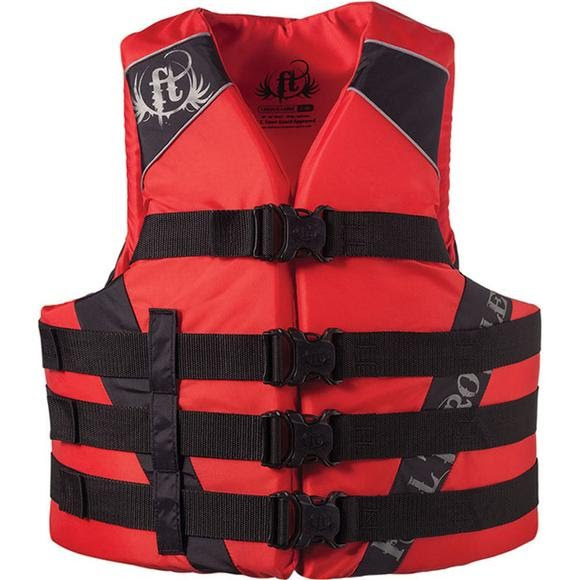 The Full Throttle Dual Sized PFD Vest is designed for the water sports enthusiast looking for style, comfort, and safety. Lightweight, durable foam contours to your body and doesn't hinder your mobility. Adjustable chest strap and belts keep this vest from riding up or shifting at inopportune moments. Great for water skiing, boating, fishing or relaxing on the water, this PDF is U.S. The Full Throttle Dual Sized PFD Vest is designed for the water sports enthusiast looking for style, comfort, and safety. Lightweight, durable foam contours to your body and doesn&apos;t hinder your mobility. Adjustable chest strap and belts keep this vest from riding up or shifting at inopportune moments. Great for water skiing, boating, fishing or relaxing on the water, this PDF is U.S. Coast Guard approved. It&apos;s recommended that children always wear a Type II PFD or lower, even for onshore activities.